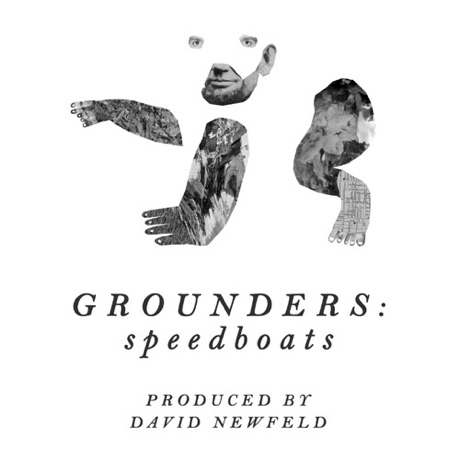 Grounders "Speedboats (David Newfeld Version)"
Toronto atmospheric pop act Grounders released their song "Speedboats" on their Wreck of a Smile EP, but they also recorded a previous version of the track with producer David Newfeld (Broken Social Scene, Super Furry Animals, Los Campesinos! ), which will be coming out on a new 7-inch. You can hear Newfeld's cinematic version of the song down below. For comparison, you can listen to the EP version of "Speedboats" here. I never really paid attention to an album's production until those Broken Social Scene records. They completely changed my conception of recorded music, and to this day I'm not sure which other producers I could put in the same league as David. Getting to meet and work with Dave was something I had dreamed about, so this was really meaningful. In 2011 we spent some time at Newfeld's church-turned-studio, recording bits and pieces of our song "Speedboats" (later recorded with Marcel Ramagnano for our EP Wreck of a Smile). Sometime during the preceding two years, Newfeld amazingly assembled those pieces into this incredibly layered, constantly shifting, distinct version of our song. This is proof that Dave's gift isn't just his predilection for good sounds, it's his uncanny vision, and ability to look at seemingly disparate elements and see the strange and interesting places they can go. Whatever we came up with in the studio was just a canvas and paint palette — the thing in the frame is signed Newfeld. This track will be released on a split 7-inch with Program, who are contributing "Waiting," which was also produced by Newfeld. The two bands will release the single with a gig at Toronto's Oz Studios (134 Ossington Ave.) on April 27. Newfeld will perform a DJ set. Scroll past the Grounders' upcoming tour schedule to hear "Speedboats (David Newfeld Version)."